It is somewhat surprising to the newly initiated that the US decided to go to war without a heavy tank. This was probably as much due to already having a well tested medium as anything else. Unlike the Germans, who seemed to have gone through a myriad of new designs, it was felt that having one basic design and the ability to refine it was probably the way to go. Plus it would be easier to maintain a parts supply, something that constantly plagued the Germans. Seems like that was the way to go as the Sherman was continually modified as the war progressed and lessons were learned. Often forgotten is that the Sherman was pretty much the king tank in the Pacific theater of operations. The Japanese tank development was woefully inadequate when it came to battling European designs. Japanese tanks seemed more designed for scouting and keeping the peace than they were for use as infantry support in major battles. Both the Army and Marines used the M4 Sherman, but it was the Marine Shermans that bore the brunt of tank fighting in the Pacific Island campaigns. One modification made by the Marines was to add wood planks to the side of the hull to keep Japanese anti-tank mines from sticking to the steel. This particular kit from Dragon has to be one of probably more than two dozen Shermans that they have released. 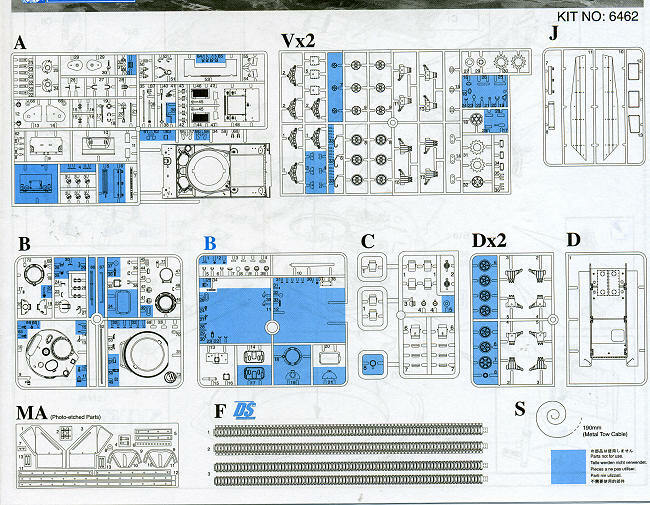 Each time, the kits seem to get better and better in terms of detailing and parts quality. 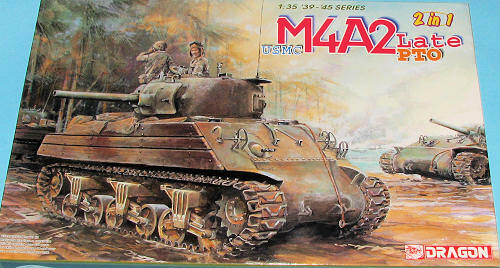 This issue of the M4A2 (late) touts a newly tooled late High Bustle turret with Cast Cheek armor, newly tooled cupolas, a slide molded gun barrel, op tional sprockets, new pistol port hatch, foldable shelf brackets on the rear, new machine gun pedestal mount and many other items. 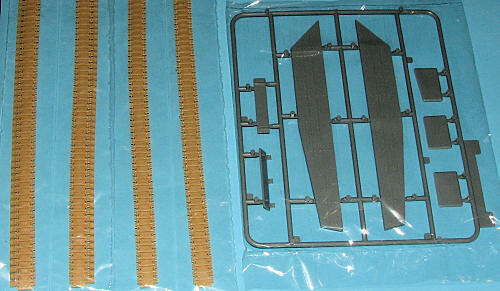 This kit also provides two styles of their DS track system, one with and one without the link extensions on it. A photo etch set is included for fenders, light guards and various brackets. A section of wire cable is also included. Instructions are very nicely done showing what options you have during construction. There are also pieces that need to be modified prior to use and that is shown. For those who are not use to photo etch, some of the smaller bits are also available in plastic. There are four options provided for markings, all in Olive Drab. One is an unmarked tank as shown on the box art. This has the wood sides and the link extensions. The others are without these items and include a tank from Peleliu in 1944 and two options for Tinian in 1943. These tanks are pretty dull in terms of markings so perhaps something a bit more interesting could be found in aftermarket. The small decal sheet is well printed and should provide no problems. With only 250 parts, this is one of Dragon's least parts intensive armor kits. The subject is one that is instantly recognizable by most, and USMC enthusiasts will have to have this one on their shelves. My thanks to www.dragonmodelsusa.com for the preview kit. It is available now at your local hobby shop or have them order it for you.